When life’s tough topics come into our homes, we search for answers in many places. How many worries have been Googled in the lonely hours of a long, dark night? We also turn to friends, family, acquaintances – anyone who may have had experience with this “thing,” this unwelcome guest that is spread out in the spare bedroom and looks to be staying awhile. When we’re facing a life challenge, books can often be a particular comfort, especially for children. Books give us a chance to examine our problem through the safety of someone else’s eyes. How did they feel? How did they react? There is also such healing power in the message you are not alone. Cynthia Lord is a Newbery Honor author who embraces big topics, and weaves them into charming stories for middle grade readers. Her latest book, HALF A CHANCE (Scholastic Press, 2014), uses the idyllic premise of spending a summer on a lake in New Hampshire as a backdrop for exploring how dementia can affect a whole family. “When Lucy’s family moves to an old house on a lake, Lucy tries to see her new home through her camera’s lens, as her father has taught her — he’s a famous photographer, away on a shoot. Will her photos ever meet his high standards? When she discovers that he’s judging a photo contest, Lucy decides to enter anonymously. She wants to find out if her eye for photography is really special — or only good enough. HALF A CHANCE is a good resource for kids who are struggling to understand the confusing and sometimes scary topic of dementia. However, the story also celebrates the simple joys of summer lake living. I think this book will bring a lot of comfort to many families. 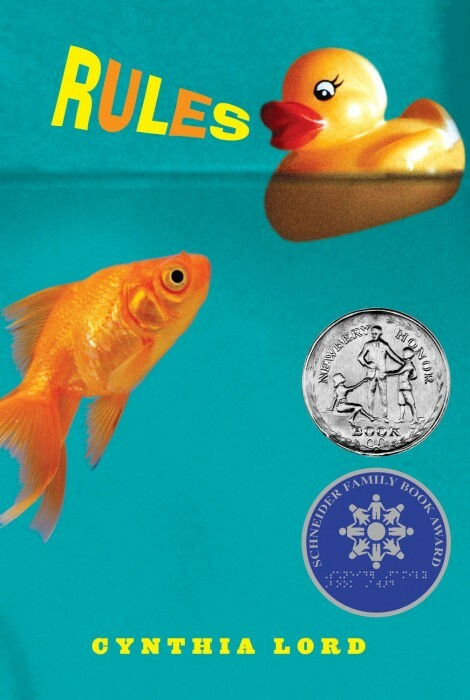 You may recognize Cynthia Lord’s name because of her 2007 Newbery Honor Book, RULES (Scholastic Press, 2006). If you missed this one, be sure to check it out. 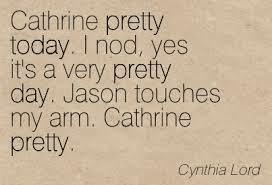 Catherine helps her younger brother navigate the world, and helps Jason express himself. But of course she learns just as much, if not more, from them. The real grace of the way Cynthia Lord writes is that she is able to take daunting, life changing challenges and remind readers that in every situation, there are things to celebrate and give thanks for. Put these two on your “to be read” pile! 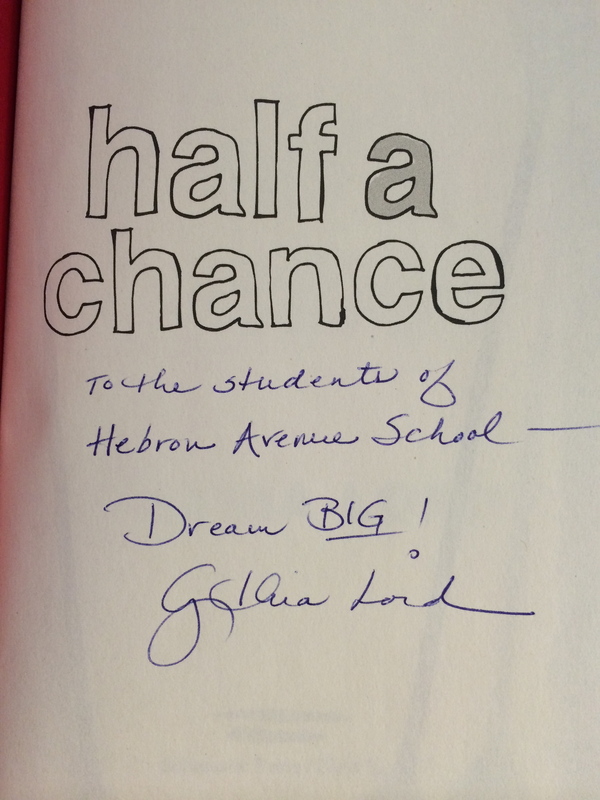 I won my copy of HALF A CHANCE thanks to Debbi Michiko Florence at DEBtastic Reads. Thanks also to Cynthia Lord, who signed it over to the students at Hebron Avenue School, where it will have a permanent home. Nancy Tandon • This entry was posted in Middle Grade Fiction, Reading, Tweens, Writing and tagged Asperger's Syndrome, Augmentative Communication, Cynthia Lord, Dementia, Newbery Honor Book. Bookmark the permalink. …and YAY for book reviews and giveaways! Love Cynthia Lord’s work. Glad to know about her new book. My kind of book. Will have to get a copy. Love the storyline.